Hello there! Before I get to today's post, I want to take a moment to reflect. Today marks the 10th anniversary of the September 11th attacks, here in the U.S. Today we honor those who lost their lives on that tragic day, those who continue to mourn the loss of their loved ones, those that were first on the scene and those serving our country in the military. 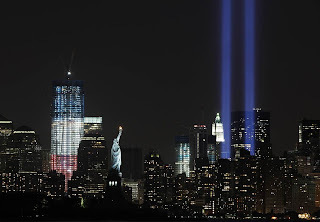 Today, as a nation, we REMEMBER...and we are strong. Pals Paper Arts is having a Halloween theme challenge and that was the perfect inspiration for my FIRST Halloween card of the year. Woot Woot, I just LOVE making cards for fall holidays! Thanks for stopping by! Please make sure to pop over to the rest of the lovely ladies on the Paper Players Design Team and check out their colorful creations. We hope you will join us this week and play along. Fabulous Halloween card, Anne Marie ! The DP fits perfect and i like the colors. Let's talk about that beautiful Razzleberry bow! Just sets the whole card off perfectly! Adorable card AM! Love the shot of Benny!!! Your card is Wicked Cool! Great use of the colors and elements! Anne Marie, I love this card. This stamp is one of my Halloween faves. Love that you embossed it and then colored it in. The perfect finishing touch....that bow. It's just fabulous! LOL I love the picture of Benny. He sure is "fluffy". :o) Awesome card; that bow is so yummy that I bet Benny wants to eat it! I know I do! Ann Marie, This is wickedly beautiful. I love how you used the new DSP for the challenge along with that great layout. And the bow is just a stunning finishing touch. Benny is too funny - what a face <3. Just look at those deliciously black patent leather boots! Woohoo! What a great, fun Halloween card! You should put a big witch's hat on Benny Max....he looks the part! Benny Max is adorable!!!! I say fluff!! Love that you embossed the image - those shoes look great with the glossy black!! Great cat paper too and the bow! Wow!!! Gorgeous card. What a great job you did with the colors. Love all of the texture on this card! Fabulous job on all 3 challenges! Benny is my kind of cat! Pure padded steel! Gotta love this color combination. What a fun card! I just love those witches feet. I keep looking at that set myself & try to resist since don't have many halloween cards to make. My resistance is fading though. The stripes embossing folder is a great effect. Is it difficult to get the lines nice & straight? Just love the black cat dsp also. Benny Max is looking especially fluffy & intense today. What a handsome fellow sitting in the chair. Looks like he's on his throne. So cute! Wow what a spectacular card! Love it. 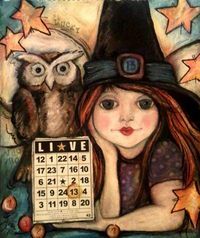 Those witches boots are too too cute. Love the touch of pearls, and colors are fabulous. What a beautiful commemorative statement about 9/11 Anne Marie. I'm so glad you took the time to remember today. This is such a fabulous card, the layout is awesome, the colors just make it perfect. Atta girl, wonderul job. Benny Max is looking mighty handsome ... love those long whiskers! Your card is a real beauty! You have such a classy style ... love it! Thanks for joining in the fun at Pals Paper Arts! Gorgeous! I need to get some of that razzleberry satin ribbon! I love the awesome Halloween card, Anne Marie! What fabulous colors! This is a really cute card! And a beautiful kitty! Wicked Cool? Yep, that's you! AWESOME card, AM! Love that dsp and the SHINY boots are fab.u.lous! The bow is just the perfect elegant touch! Way to rock it girl! 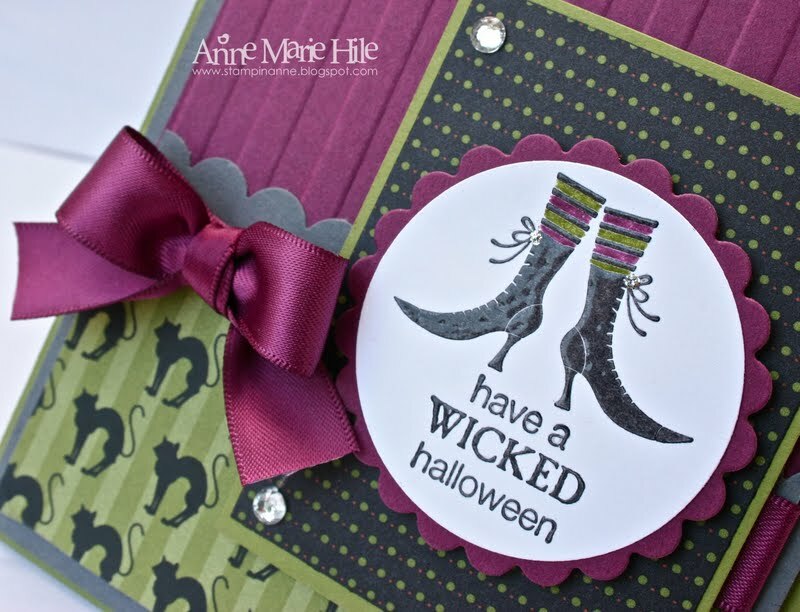 Anne Marie... love this card, its one of my favorites I have seen so far this season! lol The Spooky Season that is. 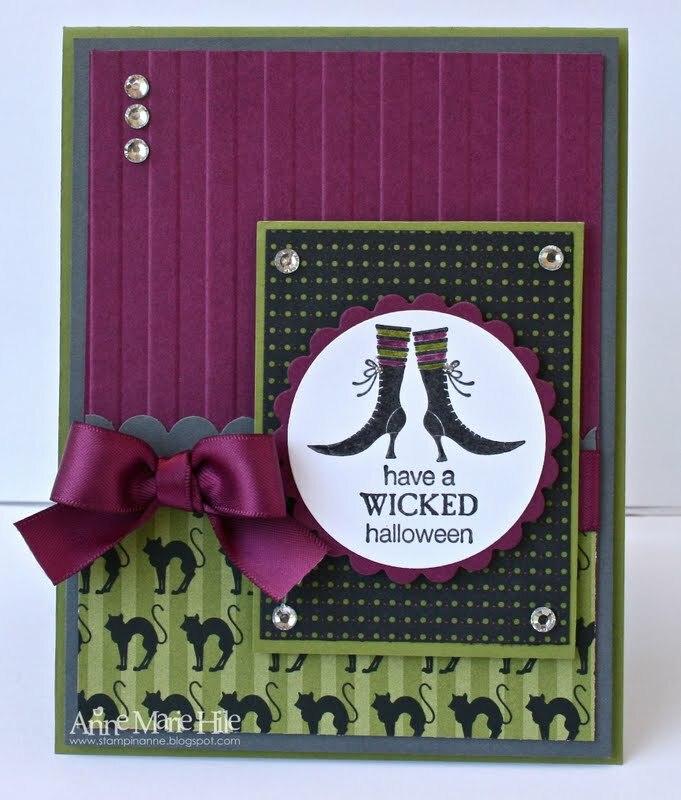 What a spooktacular card!!! Love the rich colors!!!! Thanks for playing along with the Stamping 411. Fabulous card...fabulous cat! Go Benny Maxx...you rock! Wow!! Absolutely stunning! I love the color theme, and this picture of the towers of light. 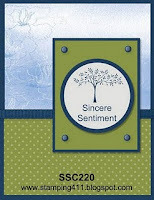 I love the rich look of the embossing... and you're making me WANT that satin ribbon! Thanks for taking the time to play along with stamping 411 this week and for sharing your talents with us.